If you’re considering backup power for your home, then a solar system that’s both grid-tied and with battery backup (bimodal) may be your best option. .
Over the past three years, we’ve installed more battery backup solar systems than anyone else in West Virginia, and, based on feedback from distributors and manufacturers, we believe we’ve installed more battery backup systems than anyone within 200 miles of our office – including parts of Pennsylvania, Maryland and Virginia in addition to West Virginia. It’s our specialty and our passion, and we consider a grid-tied solar system with battery backup to be the ultimate solar system – much better than a home with a large propane generator. On a day-to-day basis, the system produces power you use in the house, selling back excess to the power company like any other grid-tied system. But when the power goes out, it instantly switches over to the stored energy in the batteries, so you continue living a normal life with water from the well, key lighting circuits, refrigerator and freezer, and other critical loads. 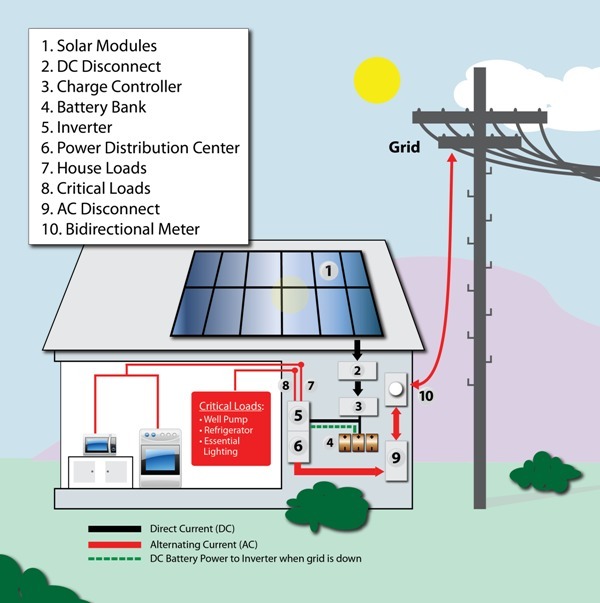 A battery backup solar system is much more complicated than the typical grid-tied system. It requires some careful planning, design, and, most important, customer participation in determining the right size and configuration for your property. We’ll guide you through that process. It’s what we do. • Bimodal – two systems in one. Standard grid-tied features when grid is up, off-grid with battery power when the grid is down.